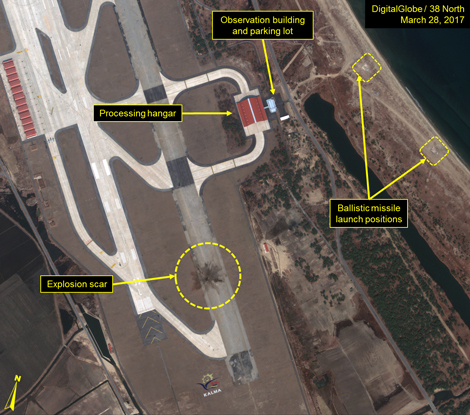 The type of missile was not released, but the Kalma Ballistic Missile Launch Site—adjacent to the Kalma International Airport (formerly known as the “Wonsan Airbase”)—is where North Korea conducted multiple tests of its Musudan (Hwasong-10/KN-07) intermediate-range ballistic missile (IRBM) in 2016. The reporting on this failed test was slower to come out and more ambiguous than normal, with no additional information provided subsequently. 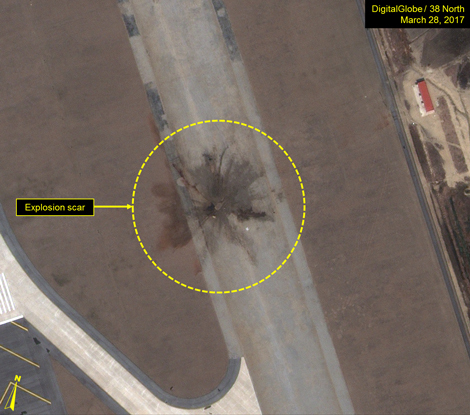 No commercial satellite imagery of the area is available from the day of the attempted test, but an image from March 28 shows evidence of a massive 110-meters-in-diameter irregular circular explosion scar on the secondary runway leading to the Kalma Ballistic Missile Launch Site. While we cannot be certain, it is highly probable that this explosion scar represents the announced missile launch failure, as it did not appear in imagery from March 19. Figure 1. 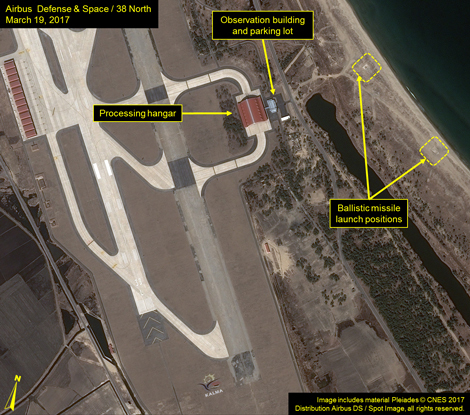 The Kalma International Airport in the days before and after the reported failed missile test. Figure 2. Close-up of the explosion scar. Kalma is an international airport, but the only activity observed here during the past two years has been flight operations from a single mixed squadron of MiG-21 and MiG-19 fighter aircraft. These flight operations almost always take place from the primary runway, not the secondary runway. If an aircraft exploded while taking off or landing, the explosion scar would be oblong in shape and would generally fade out in the direction of travel. If the explosion were caused by a fuel truck, the explosion scar would typically be oblong and heavily stretch out perpendicular to the vehicle’s path of travel, with concentrations of dark patches. 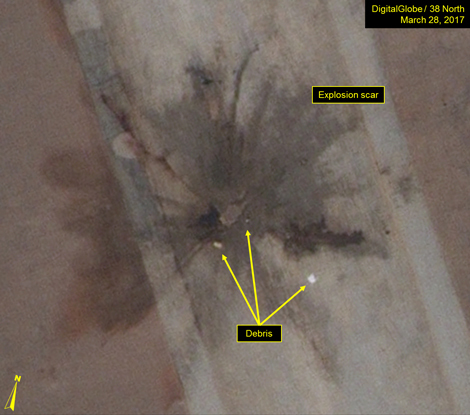 An explosion of a ballistic missile being transported or elevated for launch would tend to be large and in an irregular circular pattern, similar to the explosion scar seen in the March 28 imagery. 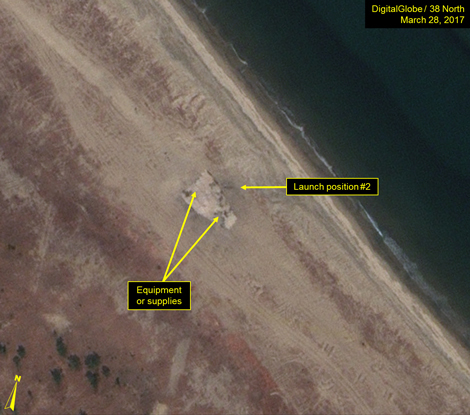 The observed explosion scar is only 400 meters away from the building used for processing the Musudan IRBMs and transporter-erector-launchers (TELs) before previous tests, and 650 meters from the two 24-meter-by-17-meter concrete-paved launch positions. Figure 3. The processing building where Musudan and associated TELs have been prepped for previous tests. Figure 4. 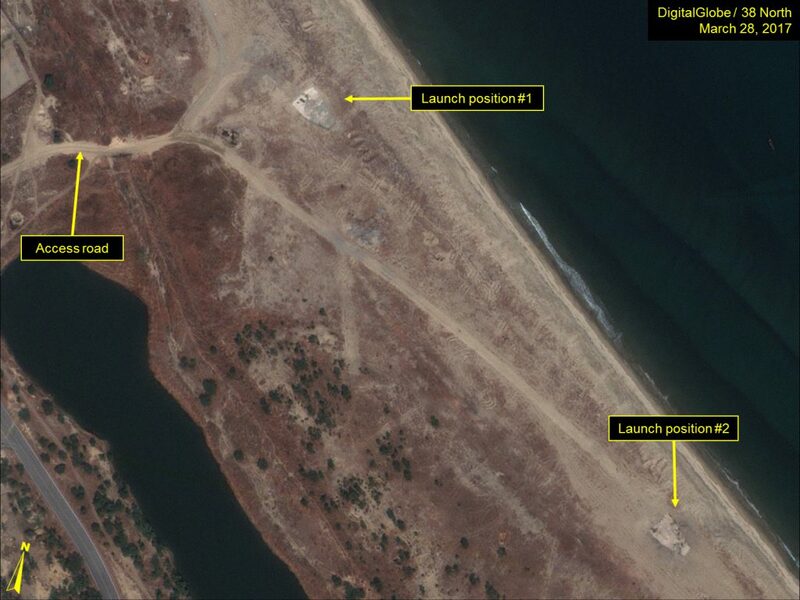 The launch positions used for previous Musudan tests. There is very little evidence of debris at or around the site, suggesting that a sizeable cleanup effort was undertaken immediately after the explosion. 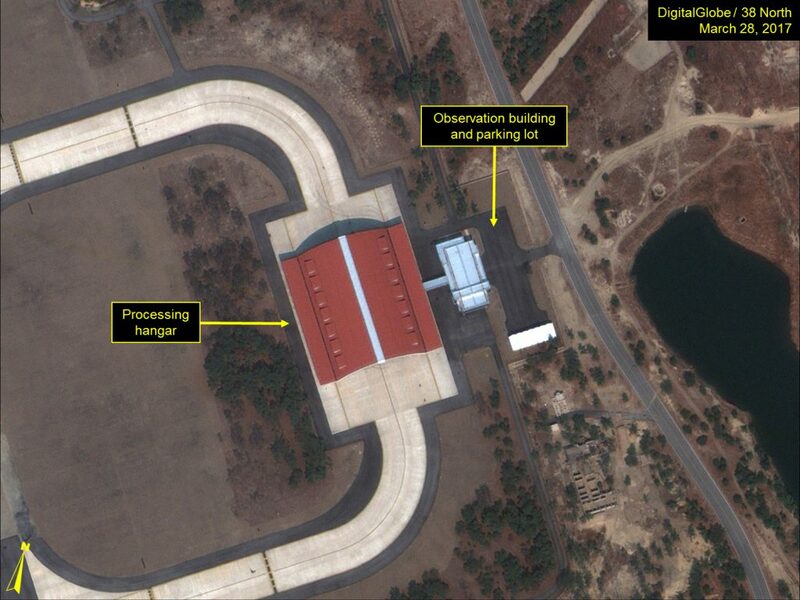 While no significant activity is seen at the processing building, small groupings of equipment or supplies are noted at the beach launch positions on March 28. 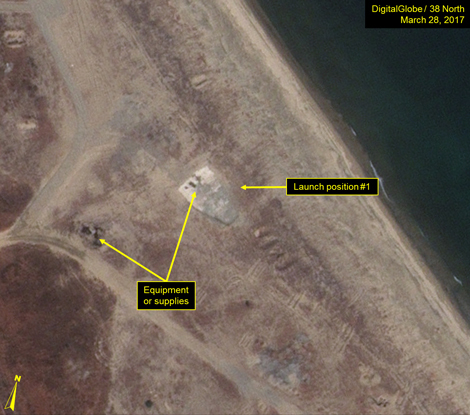 Though unconfirmed, previous use of this area for Musudan testing, as well as the large circular explosion scar near the processing building and launch positions, suggest that this failed test was for further Musudan development. Figure 5. Little debris left at the launch positions, only some equipment or supplies. Reports included: Shim, Elizabeth “North Korea missile launch failed, U.S., South Korea militaries say,” UPI, March 22, 2017, http://www.upi.com/Top_News/World-News/2017/03/22/North-Korea-missile-launch-failed-US-South-Korea-militaries-say/7091490176783/; “North Korea missile launch fails,” BBC, March 22, 2017, http://www.bbc.com/news/world-asia-39300275; and “North Korea test-fires a missile from Wonsan, but fails,” March 22, 2017, http://koreajoongangdaily.joins.com/news/article/article.aspx?aid=3031263. North Korea has also conducted two “international” airshows here during 2016.